It’s no secret that the Zelda community is not only quite large, but also unique among gaming franchises on the internet. From sites like Zelda Classic that provide a custom game along with the tools to create your own custom 2D levels, Zelda Universe with its large forum community, Zelda Dungeon with its top notch walkthroughs, ZREO with its music reorchestrations, WZMR being your source for nonstop Zelda radio all day every day, North Castle being the king of Zelda related fanworks, to us here at ZeldaInformer bringing you informative articles, it’s easy to see just how wide spread the fandom is for this franchise. Bottom line: Zelda has widespread internet support from fans, unlike the Mario Brothers, Metroid, or Pikminseries. A lot of the fans of those franchises you can find lurking at more general gaming sites such as GoNintendo or IGN. Why is this? What is it about this community that just makes it work? First of all, it comes down to the passion of the people who create the sites. As the community has grown over the years, none of it would of happened without select fans saying “I love this series so much I am going to create a fan dedication site about it.” What started as a few sites with some simple guides grew into hundreds of sites with unique personalities. Many of these sites have come gone over the years, but without fans having enough passion and love for Zelda to go through the effort of making a site, none of this happens. Why Zelda though? Mario has vastly more games and is the Nintendo mascot. Halo has a massive following of online players, and Age of Empires is a strict PC title. Why above all these titles, and so much more, does Zelda instill that passion the other games don’t? Honestly, I don’t have an answer, but I do have a few guesses. Firstly, Zelda is simply better then the rest as a franchise. Each title is a instant best seller… and not just because of its name. Each title is surprisingly a lot of fun, and there is rarely a let down. Zelda is what Zelda is, and nothing out there is like it. That may be the most important reason for its popularity: Zelda is one of a kind. Secondly, Zelda games always leave us wanting more. We finish off Ganondorf, the quest is complete, and Hyrule is saved yet again. However… something never feels quite complete. It’s as if you just know your quest isn’t really over… and thus we always want more. 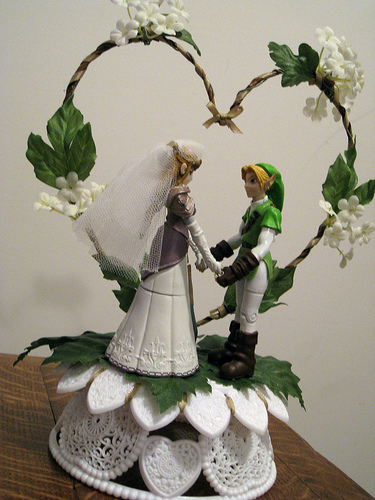 Twilight Princess did a great job of making us want more, as did Ocarina of Time. These games just make us want to play more, and thus we want more and want to express that feeling through a site. Last, but not least, is the fact that Zelda leaves a lot of questions to be answered. I am not just talking about the timeline, but life in general. Majora’s Mask started an interesting trend of linking problems in the game to real life issues we deal with as we grow up. We started to examine the other titles and notice the same thing. In short, Zelda connects with the player in ways no other game seems able to accomplish. This isn’t all to say that there are not communities out there that are as big, if not bigger, than the Zelda franchise. Among some of the larger communities for individual franchises you will find, none top the Final Fantasy series or the Pokemon franchise. In general though, none of them simply have the variety that make the Zelda Community one of a kind. In closing, I just want to say thank you. Thank you to all the fans out there that make all of this possible. It’s you guys that inspire me to run this site and keep providing content that I feel you guys will enjoy and make use of. Without the fans we would not exist, none of the Zelda sites would exist. You guys make it all possible, so I think I can say safely that we as a website community want to thank all of you for making everything possible. Everything we do is for you guys. Enjoy your time at this site, and at all the other sites out there. We, together, look forward to continuing to give the community everything it wants and then some. In The Legend of Zelda we trust.